Viaden Mobile is announcing the release of Multiplayer Slots for iPhone, iPod and iPad Casino segment and moreover the app is for FREE. 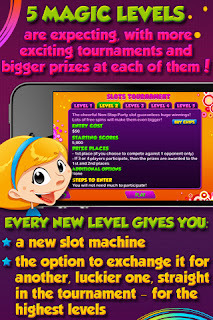 Users can enjoy the gameplay with 2 multiplayer and 1 single modes and can compete with rivals worldwide by participating in global Tournament, or play with friends. The Tournament lasts for 20 minutes and includes 5 different levels to go through. Players are able to choose the number of rivals (max. 3). The one with highest achievement wins the prize- extra chips for playing further. The amount of chips grows with the number of contestants. Extra options – switching between slot machines are available at high levels making the chance of getting lucky scatter greater. Private tournaments can be held through choosing Play with Friends mode. The number of rivals is the same – from 1 to 3. With this option users compete against their pals. Number of extra features makes the game close to reality and makes playing process more involving and exciting. For improving the strategy, players are available to spy upon their rivals’ scores. In-game chat is available for more interaction among players. When choosing single mode, the duration of the tournament can vary between 10 to 60 minutes according to the players’ desire. Users need to increase their initial points to score the victory. All 6 slot machines in high-res Retina graphics are available in this mode. For the most involved players there are extra 20 achievements available to unlock. 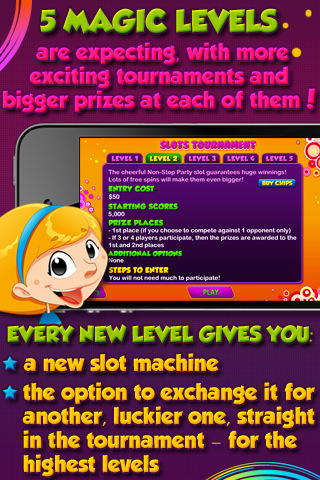 Most successful contestants will be listed on the LeaderBoard with the support of the Game Center. 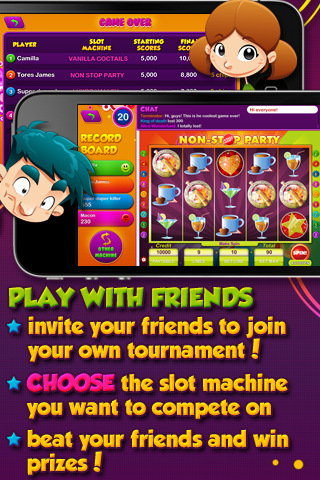 Slots Multiplayer 1.0 is free and available worldwide exclusively through the App Store in the Games category.